Speaking of makeup, i am known for my many mood changes towards different brands, especially for eye shadows. As for other things like mascara, lipstick and so on, i was quite faithful: Lancome Mascara (different types though) for years and Estee Lauder lipstick for a decade. I had my Givency moment, and my Dior years. Then, my Chanel history, a love and hate story: i love their shadows, i hate the prices. Now it seems that i am into Guerlain, and that is a decision to last. 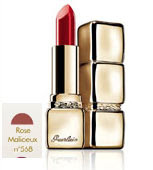 I simply adore Guerlain makeup, and i am not speaking only about eye related products. No, no, i love their face powder (cute little colorful beads, oh!) and i also manage to find a very cute silky lipstick from their KissKiss collection. Not pink, but definitely not brownish, classic, elegant, resistant: Rose Malicieux!. My kind of lipstick! Besides those above, i still have a lot of make up sets from my Channel/Dior periods... I know that in theory you should throw away your make up after six months (come on, if you want to finish an eye shadow in six months, you should buy only one very small piece, and i can't do that... when i see all those nice colors on shelves in the store, i can't resist!) but i can't! I honestly say that I've never ever finished to the bottom a case of eye shadows. I simply buy to many in a small period of time. 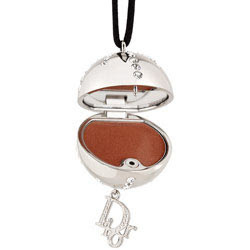 - when returning from Dusseldorf last week i spotted the Jeweled Makeup Necklace For The Lips from Dior. Gush! I love the collector pretty things Dior creates every season. I am addicted to collecting them! - today i went in town with some business... On the way back i saw in a window display the new collection of make up CYNTHIA ROWLEY created for Avon. I've read the news in the paper, and i was somehow interested. And at Avon prices, i said why not?! 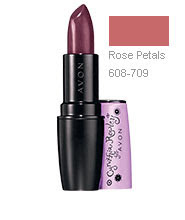 I bought the lipstick, in a Rose Petal color and a black mascara (to have when i will finish the one i am using now). I don't know how the quality is, but the flowery design it sure is nice! 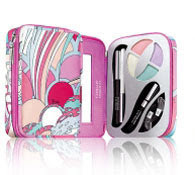 A final note: as in clothes, i fail to resist this limited, special blah blah collaborations between designers and different kinds of brands (Emilio Pucci and Guerlain, that is a classy one though, Cyntia Rowley for Avon (i would never bought an Avon product if it wasn't with the C.R. name on it) etc. Yellow is the new red!